Ross’s score is lush, suggesting the film scores of Hans Zimmer or the contemporary romantic symphonies of Howard Hanson, performed beautifully by an 18-piece orchestra under the baton of Gordon Roberts. Featured international article in Curve magazine about OperaFusion’s NOT IN MY TOWN musical drama by Michael Ross. The heroine of Not In My Town is Romaine Patterson, Shepard’s friend and now an LGBTQA rights activist. She organized counter protests, with peaceful protesters clad in angel-wing costumes that blocked hate mongers and their signs, after the Westboro Baptist Church and Rev. Fred Phelps began picketing Shepard’s funeral and the subsequent trial of his killers. Read the full Not In My Town Curve Magazine article here. Even if people think they don’t like opera, Gordon Roberts said, they’re likely to appreciate “Not In My Town,” A new opera/theatrical piece that retells the story of Matthew Shepard, a gay student from the University of Wyoming who was brutally murdered in 1998. 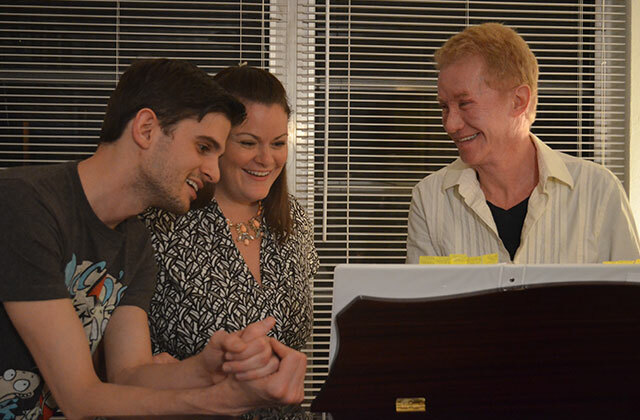 The work [Not in My Town], composed by Wilton Manors musician and teacher Michael Ross, tells Matthew Shepard’s story through the eyes of his best friend, Romaine Patterson. In 1998, two men beat and tortured University of Wyoming student Matthew Shepard in a homophobic hate crime, leaving him tied to a fence in a field outside of Laramie, Wyo. Six days later, Shepard died from his wounds. The murder led to, a little more than 10 years later, Congress passing the Matthew Shepard and James Byrd Jr. Hate Crimes Prevention Act. (Byrd was an African-American man dragged to death in Texas the same year as Shepard’s murder.) President Obama signed the act into law in 2009. Photo Credit: Frances Suzanne Hindle | The opera “Not in My Town” stars, from left, Ryan Townsend as Matthew Shepard and Robyn Marie Lamp as Romaine Patterson. Musical director and conductor Gordon Roberts is at far right. The stars shined brightly when 200 people gathered to enjoy Opera Under the Stars [an Opera Fusion fundraiser] April 4 at Kimberly and Frederic Boyer’s Hampton Green Farm in Wellington. Photo by Frances Suzanne Hindle | From left, Christina Matson, Kim Boyer, Mitzi Presnell, Joan Javits Zeeman, Birgit Fioravante and Jeanne Chisholm attend the Opera Under the Stars benefit April 4 at Hampton Green Farm in Wellington for Opera Fusion’s “Not In My Town,” a new opera about Matthew Shepard. Author, activist and former Palm Beacher Mary Fisher will be the keynote speaker at 6:30 p.m. today [April 4, 2016] at Opera Under the Stars, a fundraiser for Opera Fusion’s upcoming production of Not In My Town, a musical based on the life of Matthew Shepard at Hampton Green Farm in Wellington. Photo by Carol Carnevale | ABOVE: Opera Fusion stars on Friday, March 18 at the Adequan Global Dressage Festival in Wellington. (L-R) Baritone Xavier Garcia, soprano Robyn Marie Lamp, pianist Gordon Roberts, mezzo-soprano Christina Overton, tenor Lievens Castillo and soprano Birgit Djupedal Fioravante. Matthew Shepard’s story was pivotal for the gay movement in America, as it drew attention to hate crimes perpetrated against people for their sexuality. On October 7, 1998, two men abducted University of Wyoming student Matthew Shepard, pistol-whipped and tortured him, and tied him to a fence in a field outside Laramie, Wyoming. After a cyclist discovered Matthew, the comatose Shepard was taken to a hospital, where days later he would succumb to his injuries and pass away. Matthew Shepard’s two killers were sentenced to life in prison. Opera Fusion presented “The Sopranos” on Saturday, April 18 at the Wellington High School theater as a fundraiser for Save a Pet Florida. The two-hour show featured sopranos Laura Martínez León, Dora Cardona, Ravenna Maer and Gerri Kinley, joined on stage by male singers Lievens Castillo and Ardean Landhuis, and also Opera Fusion founders Birgit Fioravante and Dr. Xavier Garcia. “That’s what is so great about this, is that we really work well together, since our vice president, Dr. Garcia, not only is a veterinarian, he is also an opera singer,” Wells [president of Save a Pet] said of the connection between Opera Fusion and Save a Pet. Wells is glad that the core group who performed for Save a Pet last year decided to form their own company, which became Opera Fusion. “It’s just really heartwarming that this was the result of it,” Wells said, adding that she is excited to be working with the talented singers again.